Wow, what a week for college football. I’m not talking about the big upsets pulled by both Washington schools, Texas and Tennessee. I’m talking about what has taken place off the field and shaken up the world of college football. Steve Spurrier, aka “the head ball coach” and arguably a top 5 college coach of all time, resigned his post at South Carolina. Steve Sarkisian, out as USC head coach due to problems with alcohol. Will Grier, who has led the Florida Gators into playoff contention after some tough years in Gainesville, is out for the year after testing positive for performance enhancing drugs. Luckily, the focus can move back to the field with a slate of huge week 7 match ups. Both teams will take on the Oregon schools at home, Washington State gets the Beavers and Washington will take on the Ducks. They each come off of season defining upset wins last week, putting them at 3-2 and looking toward bowl berths. The Husky defense is humming and that crowd at Husky Stadium is going to be out for blood against an Oregon program that has dominated the Pac-12 and the Huskies for much of the 2000’s. 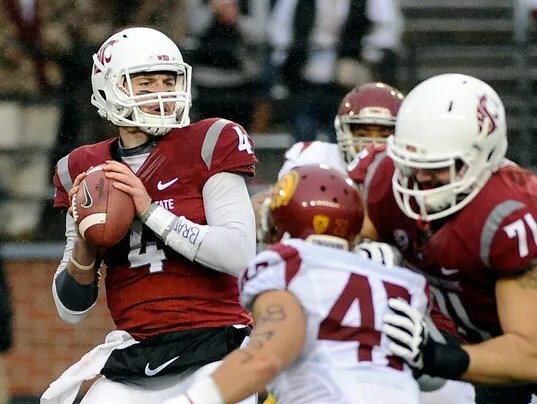 For the Cougars, they’ll look for their offense to continue to roll at the helm of gunslinger Luke Falk. I think both teams come away with wins for consecutive weeks and make it to 4-2 before they both hit the road next week. Pac-12: Best game comes with UCLA traveling to Stanford to take on the Cardinal. UCLA is following their first loss of the year against Arizona State, whereas Stanford looks to continue their roll after an opening loss to Northwestern. UCLA will need the good Josh Rosen to show up, and running back Paul Perkins to bounce back in order to knock of Stanford. Stanford Quarterback Kevin Hogan is hitting his stride right now and I look for that roll to continue at home. SEC: Alabama rolls into College Station to take on Texas A&M in a battle of SEC heavyweights. After losing to Ole Miss, Alabama has flexed their muscles against teams like Georgia but they’ll be running into an undefeated A&M team. A&M has beaten Arizona State and Mississippi State for big wins, but they really need this one to solidify themselves before having to play Ole Miss on the road and LSU in Baton Rouge to finish out the season. The game could go either way, but I think Kevin Sumlin gets the Aggies ready for the Tide and pulls out a monstrous home win. Another big match-up in the SEC: #6 LSU vs. #8 Florida. Big 10: We won’t have to wait long on the west coast for a big game when the rivalry of Michigan and Michigan State is renewed in Ann Arbor at 9:30 a.m. PST. Simply put, I think Michigan continues their dominance and does what it takes to stay undefeated before playing Ohio State at the end of the year. Jim Harbaugh has got the Wolverines hitting their stride while the Spartans have been struggling to put away inferior opponents. Look for a low scoring win for Michigan at home. Who is the team to beat in college football?